On December 12, 2008, the California Air Resources Board approved the Truck and Bus regulation to significantly reduce particulate matter, or PM, and oxides of nitrogen emissions from existing diesel vehicles operating in California. This fact sheet describes the regulatory requirements consistent with the amendments considered by the Board in December 2010. What vehicles are affected by the truck and bus regulation? What are the compliance requirements for heavier trucks and buses? Heavier trucks and buses with a GVWR greater than 26,000 pounds would have two primary ways to comply. Fleets could comply with the compliance schedule by engine model year or could use a phase-in option that is more flexible. Starting January 1, 2012, heavier trucks would be required to meet the engine model year schedule shown to the left. Fleets that comply with the schedule would install the best available PM filter on 1996 model year and newer engines and would replace the vehicle 8 years later. Trucks with 1995 model year and older engines would be replaced starting 2015. Replacements with a 2010 model year or newer engines meet the final requirements, but fleets could also replace with used trucks that would have a future compliance date on the schedule. For example, a replacement with a 2007 model year engine complies until 2023. By 2023 all trucks and buses must have 2010 model year engines with few exceptions. No reporting would be required if complying with this schedule. Fleets could comply by demonstrating they have met the percentage requirement each year as shown in the table. For example, by 2012 the fleet would need to have PM filters on 30 percent of the heavier trucks and buses in the fleet. This option counts 2007 model year and newer engines originally equipped with PM filters toward compliance and would reduce the overall number of retrofit PM filters needed. Any engine with a PM filter regardless of model year would be compliant until at least 2020. Beginning January 1, 2020, all heavier trucks and buses would need to meet the requirements specified in the Compliance Schedule for Heavier Trucks. Are there any credits or exemptions fleets can use? All fleets could make any vehicle equipped with a PM filter prior to 2014 compliant until 2020, or could make all heavier vehicles in the fleet exempt from meeting the replacement requirements until 2023 if all heavier trucks in the fleet are equipped with PM filters prior to 2014. Fleets would need to report by January 31, 2014 to take advantage. Vehicles operated less than 1000 miles per year can also be exempt from the general requirements but must be reported in the compliance year. What are the requirements for lighter trucks and buses? Lighter trucks and buses with a GVWR of 14,001 to 26,000 pounds would not have compliance requirements until 2015. The Engine Model Year Schedule for Lighter Trucks table lists the compliance dates that would apply by engine model year for lighter trucks. Starting January 1, 2015, lighter trucks with engines that are 20 years or older would need to be replaced with newer trucks. Starting January 1, 2020, all remaining trucks and buses would need to be replaced so that they would all have 2010 model year engines or equivalent emissions by 2023. No reporting would be required. Fleets would also have the option to install a PM filter retrofit on a lighter truck by 2014 to make the truck exempt from replacement until January 1, 2020, and any lighter truck equipped with a PM filter retrofit prior to July 2011 would receive credit toward the compliance requirements for a heavier truck or bus in the same fleet. Are there any other provisions for exemptions or delays? The regulation has special provisions that delay some or all of the compliance requirements, but fleets must report to take advantage of them. By April 29, 2011, fleets would need to report to qualify for lower use and specialty agricultural truck exemptions until 2017 or 2023 and must report hour meter readings for sweepers with auxiliary Tier 0 engines. Fleets would need to report by January 31, 2012 to take advantage of delays until 2014 for small fleets with one to three vehicles, log trucks, lower use construction trucks, and vehicles operating in parts of the state with less polluted air. School buses with a GVWR more than 14,000 pounds would need to meet PM filter requirements from 2012 to 2014. School bus fleets would need to demonstrate that 33 percent of their buses have PM filters by 2012, 66 percent by 2013 and 100 percent by 2014. If an engine cannot be equipped with a PM filter it will need to be replaced by January 1, 2018. 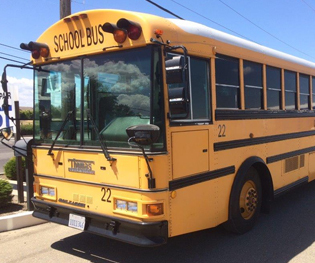 Pre-1977 model year school buses must be replaced by 2012. No reporting is required, but fleets must keep records. If I decide to sell my vehicle, do I have to notify the buyer of the requirements of this regulation? Yes. Any person selling a vehicle subject to the Truck and Bus Regulation must provide a specific disclosure statement in writing to the buyer on the bill of sale, sales contract addendum, or invoice. See Regulatory Advisory 416 at www.arb.ca.gov/enf/advs/advs416.pdf. Other fact sheets and additional information are available at: www.arb.ca.gov/dieseltruck or by calling ARB’s diesel hotline at (866) 6DIESEL (866-634-3735). To obtain this document in an alternative format or language, please contact (866) 634-3735. TTY/TDD/ Speech to Speech users may dial 711 for the California Relay Service.